Unadventurous wine lists at corporate parties and weddings tend to read something like this: Sauvignon Blanc, Chardonnay, Merlot, Cabernet Sauvignon. Sauvignon Blanc tops the list so often because it tends to be fruity and very food-friendly, with fun, juicy acids. But if you’re itching to get out of the Sauvignon Blanc rut — and if you’re reading this, I suspect you are — I’ve got just the white for you: Godello. Even so, it can be hard to find this “fine white grape variety” (The Oxford Companion to Wine), because Galician vineyards and wineries tend to be small, with necessarily limited production, and much of what is produced is consumed locally. The Galicians know a good thing when they taste it. I felt very lucky, therefore, when I spotted it on the wines-by-the-glass list at Carter’s Kitchen, a delightful casual restaurant tucked away in Mount Pleasant, a suburb of Charleston, South Carolina. Carter’s Kitchen offered the 2011 Valdesil Montenovo Godello for $8 a glass, one of the least-expensive wines on the list. I needed something with some serious acids to compete with the decadent seafood I’d just ordered, and the Godello proved up to the challenge. It started with some sweet, apply fruit, but this was quickly overtaken by focused, limey acids which carried through to a white-peppery finish. 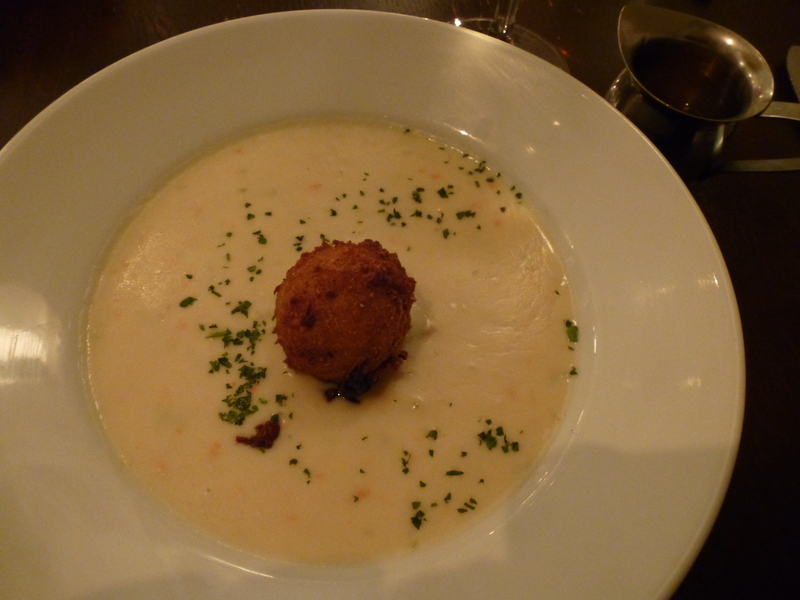 The wine cut right through the richness of a creamy and thick she crab soup (pictured above), and it kept its laser focus against some beautifully fresh fried “doormat flounder” as well. I wouldn’t hesitate to order it again with seafood, pork, chicken, pasta with cream sauce, risotto… Its juicy fruit and tight acids ensure that it can stand up to all sorts of rich foods, clearing the palate to prepare for the next bite. Keep an eye out for Godellos — if you like Sauvignon Blanc, a nervy Godello from Galicia will be right up your palate. 2011 Valdesil Montenovo Godello: Fruity but focused, with tight acids that can shine right through a host of rich foods. An excellent escape from a Sauvignon Blanc rut. Chill well before serving. Find It: Williams-Sonoma sells this particular Godello for $15, but don’t worry if you can’t find this specific label. Binny’s, for example, lists nine different Godellos on its website ranging in price from $10 to $50 a bottle. Also check out my review of this Godello from Galicia’s Monterrei region.